The Subversive Archaeologist: Beyond the Pale. Each day I've been expecting to see my suitcase awaiting my return to Chata Macocha. And each evening for the last four I've endured uncomfortably sweaty disappointment. But that's not why I came here tonight. Instead it was to rail against the dying of the light. Or words to that effect. It seems that, once more, we're hearing of the crucial role that alcohol plays in cultures across space and time, and it gives me comfort, as I sip my fave white wine, that, barring the enormous downside of its abuse alcohol induces the feeling of well-being and helps to stave off those negative feelings that, for me, attend the progressive senility of my body and the effect that it has on my feeling of well-being. [Call it pathetic. Call it what you will. The ancient and modern people of the world couldn't have got it that wrong! 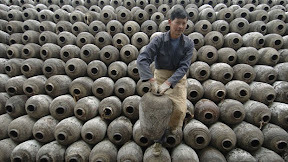 From Xinhua comes news of ancient winemaking in what's now called China. Most of us, I'm afraid, don't immediately think of drink when we think of Chinese cultures, recent or ancient. It's a thoroughly uninformed viewpoint, as I now discover, and one that clears up what was, for me, a huge anomaly in my construction of how cultures have developed over time. This post was made possible in part by the kind and generous gifts received from Catherine Pasquale, Don Kerr, Sheahan Bestel, Katrina MacDonald, Diane Hanson, and Iain Davidson. I am in their debt. Who Said Anything About Class Warfare?